Earlier this month while I was designing the page “Little Bird Becomes a Great Eagle” a song I heard many years ago began to play in my head. It was Hey, Little Bird, I Remember You written and sung by Buffy St. Marie. I searched long and hard for the lyrics online but failed to find them. So I transcribed a verse from my iTunes library. I had the great pleasure of seeing her perform live in San Francisco almost 30 years ago. From Wikipedia: “She became an active friend of the Bahá’í Faith by the mid-1970s when she is said to have appeared in the 1973 Third National Baha’i Youth Conference at the Oklahoma State Fairgrounds, Oklahoma City, OK, with several artists including Seals & Crofts and has continued to appear at concerts, conferences and conventions of that religion since then. In 1992 Sainte-Marie appeared in the musical event prelude to the Bahá’í World Congress; a double concert “Live Unity: The Sound of the World” in 1992 with video broadcast and documentary. In the video documentary of the event Sainte-Marie is seen on the Dini Petty Show explaining the Bahá’í Faith teaching of Progressive Revelation. The song Hey, Little Bird, I Remember You appears on her 1967 album, Fire and Fleet and Candlelight. This is the link to the Wikipedia overview of Buffy St. Marie’s life. You’ll find the section of Censorship very interesting as it reflects what happened to Native North American artists in the United States. 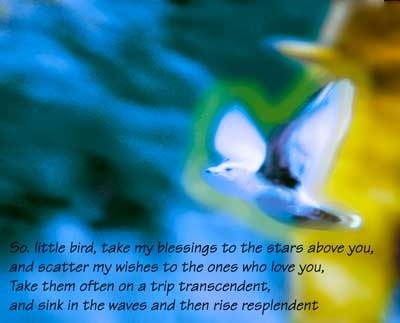 One of the song’s most beautiful verses is overlayed on my photograph above. Fair Use applies. Buy some of her albums! Here’s a six second clip from the song. Right-click on the link and select Save Target (IE) or Save Link As (Firefox) to download it.